This discussion stemmed from the Reefs at Risk report compiled by the World Resources Institute (WRI). The initial participant questioned some of the conclusions drawn in the report about the threats posed to the reefs in the Florida Keys. WRI responded by noting that the report was not meant to examine specific reef degradation. Rather, it was a first attempt at a global view of the potential threats to reefs worldwide. Despite the “big picture” perspective of the report, the discussion quickly branched off to discuss the condition of the Florida reefs in particular and whether time and money should be spent monitoring and researching the degradation, or promoting active reef remediation and conservation. Other Caribbean reefs are only briefly discussed. 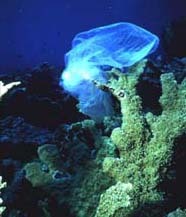 Marine debris can cause significant damage to coral reefs. Participants who emphasized the need for more research suggested that scientists must determine specific goals for monitoring Florida’s reefs, and must develop a clear and definite conservation methodology. Other participants insisted that scientists need to determine the patterns of reef decline before deciding where to allocate resources for remediation efforts. The most seriously degraded reefs need to be identified to accurately and intelligently apply remedial action, according to one participant. A diver measures coral damage in the Florida Keys National Marine Sanctuary. Damage can result from a number of factors, including boat groundings. Another participant argued that pointing fingers at specific causes of degradation (i.e. nutrient runoff, overfishing, etc.) is inappropriate until the problem can be linked scientifically to a cause. More experimental research—not just monitoring—is needed to better understand reef regeneration before applying restoration efforts. In the meantime, best management practices on local and regional scales should be implemented, according to one participant. Another participant notes that relatively little funding is available for developing solutions to reef problems, but funding is readily available for monitoring projects. A diver works to remove blackband disease from a brain coral. Coral reefs of the Florida Keys have been declining for the past 15 years. Despite millions spent researching and monitoring reefs, their conditions don’t seem to be improving, according to one participant. Another suggested that scientists already know the effects of runoff on reefs, and therefore, should concentrate their efforts on restorative and protective measures. Another comment echoed this sentiment. Scientists should not waste their time “teasing apart” data, and getting “hopelessly confounded.” Rather, they should make more active efforts to protect the reefs, according to the participant. Another participant suggested specific measures scientists can take to begin remedial efforts. For instance, reef advocates should tend to the reefs like “gardens” to reduce stressors like algal overgrowth and sediment. Diadema and herbivores also can be grown in culture to add to the reef systems. In addition, more money should be spent to improve sewage treatment and minimize runoff. “Practical politics and consciousness” are needed to improve the condition of the reefs, according to the participant. Finally, remedial efforts can be best accomplished by fostering community support and encouraging participation, which one participant viewed as the “primary solution” to reef degradation. Scientists should spend time explaining to the public that their actions can make a difference in reef protection, according to another participant. Another participant noted that though community support is important, equally important solutions may exist that vary according to location. One participant (Meier) summed up the nature of the discussion as indicative of the ongoing debate between “reductionist” research and “holistic” research. The Reefs at Risk report focused on holistic research—a large-scale effort to produce indicators of threats to reefs and “testable predictions.” However, many of the comments in the thread were reductionist in nature—concentrating on specific details of the Florida reefs. This dichotomy can be frustrating for scientists and may have contributed to the somewhat contentious nature of the debate. The participant suggested that the types of research be viewed as points along a continuum, and thereby not necessarily exclusive of one another. The participant also rejected the notion that one cause can be linked to one effect. More likely, a chain of complex ecosystems are interacting, and no single cause for reef degradation can be identified. Thus, no single approach will reverse the trend, as long as human populations continue to grow and exploit natural resources.